It is so sad to know that in almost all traces of corruption and abuse of power, there also exist traces of INC culprits who use the power and influence of the Church Administration in exploiting the loot and spoils of corruption. There was a time in the history of the Iglesia Ni Cristo that the church was highly revered, admired by many and well respected not only in the Philippines but all over the world. A mere mention of the name INC being implicated in cases of corruption and controversies was a rarity like no other. And if by any chance, anybody would dare drag the name of the church in any form of scandal, there will definitely be corrective measures to ensure that there was transparency and accountability. But that was then… now is a whole new era with a whole new breed of Ministers and Members, and a whole new story of a dark looming era for the church… an era of manipulation, coercion and absolute blind submission. One of the most corrupt agencies in the government is the Bureau of Customs. It is where corruption is really deep-rooted and as common and accepted as the changing of the tides. It became one of the best deep pocket mechanism of the government for its own personal gains, thus anybody who will be “placed” in position there (any position) is surely set up for life. That is why even if the corruption in the BoC is an open secret, it is only spoken in hushed voices at every corner of the Bureau as nobody wanted to rock the boat, especially if it’s an Argo of a boat. So how did the INC get mix up in all of these? Well, historically speaking, the INC has special interests in the Bureau not because of the money making potential it yields but because the church needed to protect its interests. There was a point in time when shipments and cargos intended for the church were either being blocked or stolen as part of the persecution of the church. That is why in the interest of safeguarding the cargoes containing materials, products or equipments intended for the church, bought and paid for by the offerings of the brethren for its sacred purpose, the church administration made sure that our rights were being protected as a non-profit, religious institution. It was a time when trustworthy people were actually trustworthy and no amount of money or bribery can blemish the trust bestowed upon them. But…. that was then. Years passed and the name of the church was already recognized and highly respected and problems regarding shipments and cargos for the church passing thru customs became a thing of the past, minimal if not non-existent. But not until the changing of the guards. When Bro. Eraño G. Manalo, the late Executive Minister passed away, the shift of administration commenced, it was a free-for-all frenzy for sucking up for those “juicy” positions in the church and in the government where strong clout of the church exists. Everybody wanted to make a name for himself by impressing the new Executive Minister, unfortunately there were too many things going on, that underneath all of the top level formalities, there was chaos and a lot of power-grabbing courtship. And when the dust finally settled, the sly and the insidious were among those who were left standing. And they began their reign of stealth and cunning in the realm of corruption, wherever it may be. And what used to be for the safeguarding of the interest of the church, turned into profiteering in whatever activities the church undertakes. Whether it be regular supplies for construction of houses of worship, textiles for church uniforms, equipments for the offices or housing projects, food, rice, fuel, Bibles, tissue paper, you name it, they will find a way to profit from it, and the worst part of it, Sanggunian Ministers became the head honchos in all of these, everything has to pass thru them… everything! Even the corrupt INC members who profited before began to complain because the “bosses” became too greedy and they were losing their shares. Yet, only the people who knows about this are either close friends of the Sanggunian or are those who are also in it. But just when they thought they could hide their secret forever, they were mistaken. Because now the whole world knows one of the well-kept dark secrets of the INC Sanggunian that has been their special goose that laid their golden eggs. But the Bureau of Customs… is just one of them. You know, when we don’t know the truth, but the fish are smelling funny and it is not Denmark, then we have to look around at the hints, the odors, the smoke, no matter how wispy. We need to align some sketchy evidence and make some deductions to draw a picture, because it is more believable and better than any information being given to us straight by the National Government or coming from incomplete and inclusive stories from newspapers and other media. Yes, we are referring to the Bureau of Customs (BOC), which once again has snagged the dubious distinction of being perceived by the public as the most corrupt government organization according to the latest Social Weather Station (SWS) survey. But it is not enough to state something that is so widely accepted by the Filipino people, and apparently by the government itself, including those high officials who have responsibility for overseeing it. Perhaps we should attempt to give flesh to what we can know and can deduce about institutionalized corruption at the BOC, that is in such stark and glaring contrast to the other successful accomplishments of this Administration’s Daang Matuwid program. When one considers that its twin agency, the Bureau of Internal Revenue (BIR), was also a den of corruption as deeply entrenched and publicly reviled as the BOC is now, and look at the miracle of transformation that has been accomplished there, then we can retain hope that it is still possible to remove the BOC blight on Daang Matuwid. To those who might complain that this is so speculative that it is irresponsible to publish it, I would respond, even if it is fiction, it is more substantial than the information provided to the public today. Consider it a call for transparency from the Aquino Administration and people who are inserting themselves, such as Senator Escudero. Kindly tell us the straight story if these deductions are wrong. Don’t blame us for wanting corruption out of the Bureau of Customs. Abbreviations: Iglesia ni Cristo (INC), Bureau of Customs (BOC), Department of Justice (DOJ), National Intelligence Coordinating Agency (NICA). There is and was no legitimate, public-service reason to remove him or allow him to resign. What was Sevilla’s mission? The predecessor whom he replaced turned in his resignation after President Aquino in his 2013 SONA lambasted the extent of corruption at the BOC and denounced it as being perceived as the most corrupt agency in the government. Sevilla’s charter was to clean out that corruption, and from all reports and appearances, he had the track record, the competence, and was achieving great progress in achieving his mission. Yet, he is now gone. The fact that his replacement was ready the day following his resignation suggests this was an orchestrated result. There can only be secret, probably political or self-serving reasons for this, as no explanation has been forthcoming that makes any sense. Observation/Deduction #2a. BOC is a part of a Political Machine, a good old boy network of power, favor and impunity with top players reaching as far as President Aquino, Department of Finance Secretary Caesar Purisima, Executive Secretary Ochoa, and new Customs Head Alberto Lina. The INC leadership is a part of this club at some level. Basis:These officials had the power to appoint the head of the BOC’s Security Services agency over Sevilla’s objection, and they were intent upon doing that. This incited Mr. Sevilla to resign. Sevilla says INC exerted influence in the appointment, but acknowledges information comes to him from others and is unconfirmed. Observation/Deduction#2b. At BOC, the tara protection and smuggling racket is a colossal Money Machine (tara is the payment of a fee by importers to cause BOC to “look the other way”). Basis: A tara payment per container runs about 80,000 pesos on average. There are 5,000 containers coming under BOC control every day! That is a potential fee base of 400 million pesos a day. Assuming a 360 day year, that’s almost 150 Billion pesos per year! It’s a brilliant business model. Shippers and importers are willing to pay this fee because their containers pass right through Customs without the delay of inspections. They pay duties based solely on declared value of goods, typically undervalued by at least 50%, and, whats more, the tara payment is recovered from customers or treated as part of the cost of doing business. There were allegations by a rival party that a major reason why Sevilla quit was he was being asked to use this money machine to fund campaign expenses for the Liberal Party to the tune of 3 billion pesos. This would be ethically inconceivable for this squeaky clean former Goldman Sachs executive. The scheme has been denied by top Liberal Party officials so it is hard to give it any credence; but if it were true, its disclosure would deal a catastrophic blow to the Administration and the Liberal Party’s credibility. So the question lingers and will persist in an environment lacking total candor: was Sevilla pressured over the issue of political appointments or being required to raise LP campaign funds using illegal tara proceeds? Observation/Deduction #3. Iglisia ni Cristo has a direct working relationship with BOC and may be complicit in smuggling and the “tara” protection racket. Basis: Note the stridency of INC’s effort to keep the Department of Justice out of investigations into Church affairs. Sevilla also mentioned unverified reports of INC influence in appointments of staff. Cases in point: (a) Ariel Nepomuceno, a suspected ringleader and organizer of the tarascams dating back 2006-2010, was backed by the INC to be appointed as Deputy Commissioner of Enforcement Services under Commissioner Lina (refer to an unverified NICA report, discussed later). (b) Atty. Teddy Raval, an INC member, was promoted to head of BOC Security and Customs police at the behest of the Church, in spite of Sevilla objection; the position is crucial to impounding and releasing containers and goods under BOC custody. Both Finance Secretary Purisima and Lina had extensive dealings with each other as cabinet officials under GMA and in private business ventures. Lina tried to institute the balikbayan inspections over strong criticisms from all sectors of the public and government. He was deaf to all complaints. Lina’s response to his own Intelligence Chief’s’ public airing of lingering corruption problems in BOC was anger and reprimand, not concern for public welfare [“Dellosa says graft remains at Customs; Lina dares him to name names“; ABS-CBN News]. Dellosa was appointed Deputy Commissioner under Sevilla and worked closely with him in instituting a merit-based and corruption-free awards and promotion system within BOC in an effort to reform the institutionalized culture of corruption. Deduction #5. President Aquino is not complicit in BOC money games. Basis: He blasted BOC in his 2013 SONA. He quickly overturned Lina on the Balikbayan fiasco. Follow-up deduction: The President’s loyalty and trust in those close to him is being used by financial beneficiaries of BOC scams. Follow-up deduction: The Administration’s credibility for straight-path governance is seriously damaged. Follow-up deduction:Presidential aspirant Mar Roxas will pay a price as the continuing corruption at BOC serves as a vivid reminder of a failure of straight path governance. Deduction #6. Senator Escudero is involved in some way, for political or personal gain.Basis: He is strident and out of order in his attack upon the DOJ for investigating the INC hostage-taking incident. He is a legislator undermining a law enforcement agency in favor of a special interest. 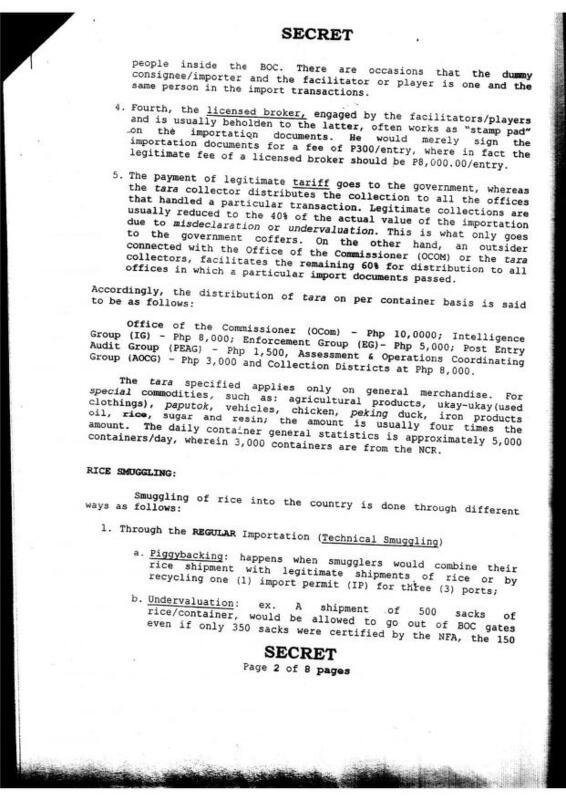 He is named as an accomplice in the following “secret” NICA report about INC’s involvement with BOC. At the least, he is undermining DOJ to cater to INC’s bloc voting in support of his own Vice Presidential aspirations. Or he is more deeply engaged. What do we do if we have a report that is unverified but stunning in its revelations? NICA is the Philippine version of America’s CIA (Central Intelligence Agency). The subject report was published in April of 2014 and it explains how protection money and rice smuggling rackets are conducted. It implicates Senator Escudero and INC among others. The report is a cut and paste job, with typefaces not matching . . . as if fresh and un-edited from the secret agent’s mini-camera. Stolen in the middle of the night, as it were. Transparency is needed to explain this report. Unless the INC ex-minister is interviewed by the NBI or some other public or private investigative agency or party, it cannot be held out as a true copy of an official document. Thus it is but the thinnest, and tiniest whiff of smoke from the proverbial smoking gun. However, its strongest claim to authenticity is its highly detailed description of the modus operandi used in the tara protection rackets and smuggling syndicates, as well as the names of the ringleaders, operatives, and beneficiaries within and outside the BOC. Moreover, it provides the names and positions of the BOC insiders interviewed in order to obtain the information included in the report. Any effort to verify the report’s authenticity would include simply contacting and securing affidavits from the interviewees detailing their involvement in preparing the report, the names and descriptions of the interviewers, and a list of who ordered and received copies of the report, in order to understand if there was a followup investigation, and if not, why not? And if there was, what were the conclusions and what actions resulted from the investigations? The Sevilla resignation and his citing of possible INC influence over positions also lends credibility to the report, and suggests a strange INC institutional influence in official government appointments . . . for what possible purpose? Erdy Codera (aka: Ka Erds) Chief Political Affairs Officer of the INC; handles all political entanglements of the INC; primary liaison of the INC to the Philippine Government; close to Jerry Acuzar, Ka Jun Santos (INC CFO); Ka Erds pushed for making Real Bank of Jerry Acuzar as INC depository bank; Jerry Acuzar is the brother in law of ES Ochoa. Francis Escudero (aka Chiz): Main beneficiary of the Alex Sy/Noel Mariano/Nepo payment scheme. Tara may be defined as protection money paid by a cosignee and importer normally per container per week per port. . . . The tara ensures that “no alert” reports on the shipment or “no hit” on a particular importation would be made by BOC officials . . . Accordingly, the distribution of the tara on per container basis is said to be as follows: Office of the Commissioner (OCom) – Php 10,000; Intelligence Group (IG) – Php 8,000; Post Entry Audit Group (PEAG) – Php 1,500; Assessment & Operations Coordinating Group (AOCG) – Php 3,000 and collection districts at Php 8,000. It appears that at the center of the tara scheme during Comm Biazon’s time, is Ariel Nepomuceno whose name was repeatedly mentioned by sources from both inside and outside the BOC. . . . He is former: (i) Staff of Senator Francis Escudero . . . He was appointed as Deputy Commissioner of BOC in November 2013. Considering that the information which the Agency holds still lacks the legal foundation to hold water in the courts, it is recommended that the tara system in the BOC be referred to appropriate government investigative body (NBI or PNP). A freight forwarder has stepped forward and revealed that there was indeed a “tara” or bribery system they adhered to with the Bureau of Customs for the faster processing of balikbayan boxes in ports. In a report from GMA’s “24 Oras” on Wednesday, Door to Door Consolidators Association of the Philippines chairman Ramon Ungco confirmed the supposed bribery system. “Kailangan magbigay ka ng tara kasi kung hindi, hindi aasikasuhin ang papeles mo,” he said. According to Ungco, they had to pay corrupt Customs officials around P40,000 to P85,000 for each container that had balikbayan boxes. He said the bribe depended on the size of the shipment. “Kami naman, lalo na ako, magnenegosyo ako sa Pilipinas alam kong corrupt. Magtatara ako para bumilis lang. ‘Yan lang ang hinahabol namin kasi mga balikbayan yan,” he said. Customs also recently increased taxes for containers from the US from P80,000 to P120,000. “Okay lang sa akin taasan ‘yung tax up to P200,000 puwede kaya lang dapat bawasan niyo ‘yung tara niyo,” Ungco said. Top Customs officials were not immediately available for comment as of posting time. The Bureau has come under fire from the public over a plan to do random physical inspections of balikbayan boxes. The plan has since been shelved. No known follow-up report was done on this story, and no other news agencies appear to have reported the story. Transparency. This was one of Sevilla’s main accomplishments in transforming BOC as an organization while he was there. Transparency seems nowhere to be found right now. A straight path for BOC. Was the Sevilla resignation orchestrated by Sec. Purisima and Exec. Sec. Ochoa? On what basis? For what governmental purpose? How did it come to pass that Secretary Lina was available for service the day after the Sevilla resignation? Was INC influence brought to bear on official appointments within BOC? What were the circumstances and the results? What was given, what was received? Why is Sec Lina so defensive about corruption? Is he on the straight path or is he continuing the tradition of hiding misdeeds? Is DOJ investigating the NICA report or tara scheme? If not, why not. I must say, my confidence in the Lina appointment is a hair above zero. He seems absolutely lacking in diplomacy and commitment to the straight path. Rather, he criticizes the critics, as do accused crooks. What legislative purpose is served by your criticism of DOJ in favor of INC? Which is more important to you, the coddling of special interests for the votes they may deliver, or the public interest and a well-respected rule of law? What is your reaction to the “secret” NICA report? Is this all politics, I wonder? Both within the Administration and Escudero camps? Are they just getting ready for 2016? Courting INC? Public interest be damned? It’s distasteful when the courting is done via an agency considered the most corrupt in the nation. Favors given and received can’t help but come with a huge stink attached. What do I want? I want heads need to roll, but I’m confident it won’t be Purisima or Ochoa, as they are among the President’s most senior, valuable people. They anchor good government processes, perhaps while engaged in a bad one, a real stinkeroo. It is hard to terminate Lina given that Sevilla was pushed out to bring him in. So I don’t know whose head needs to roll. Mar Roxas will pay the price, and that’s a pity. He gets attached to a straight path that is decidedly bent. Mr. Aquino is in a box. I suspect his trust in subordinates has been misused, as it was with another guy named Purisima. If he does not cure this with firm and transparent acts, the straight path suffers a very heavy, heavy blow. If there is something wrong in someone’s life, the President is often held responsible for it. He’s our nation’s Daddy, the priest, the nurse, Mr. Fix it. Every complaint known to Filipino-kind ends up as the President’s desk, usually as blame. Never mind that the sitting President has done more for the nation than any other President since sliced bread. So I think it is necessary for more objective, less personally involved, critics to consider what is a reasonable complaint, and what is not. Poverty is a problem not yet solved, but to lay blame for that on the desk of the President when it has been here since Aquinaldo is a little irrational. Congestion is a problem not yet solved, but when it is being caused by jobs and construction by a President who has the economy humming and more infrastructure-building going on since . . . well, sliced bread . . . then it is a little extreme to flip the good deeds inside out and slam them on the President’s desk as a complaint. Now as to rulings and processes on roads and vehicles, or the inability of cities to agree on procedures, complain away. Just not to the President. But what about legitimate complaints about the President, specifically? Should we hide from them because we don’t want to beat on a President who is beaten upon regularly? No. We have to lay them on the table. For the lessons to be learned. We need to be coldly and honorably dispassionate. Previous Previous post: WHO ARE THE REAL GUARDIANS OF OUR FAITH? Next Next post: EVM: THERE IS ABSOLUTELY NO CORRUPTION!